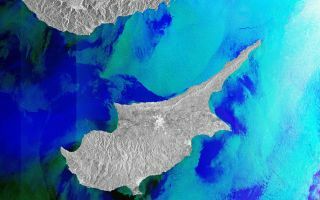 Covering part of the Eastern Mediterranean this Envisat image is dominated by the island of Cyprus. The capital and largest city, Nicosia, is located near the centre of the image. Covering part of the Eastern Mediterranean in this cool space wallpaper is this Envisat image, which is dominated by the island of Cyprus. The capital and largest city, Nicosia, is located near the centre of the image. The capital and largest city, Nicosia, is located near the centre of the image. Around Nicosia we see a concentration of white specks. This is the typical appearance of built-up areas in radar images, since the radar beam is reflected by buildings and other constructions. Similar concentrations are seen south east of Nicosia, where the seafront city of Larnaca lies, and further west along the coast to Limassol, the island’s second largest city. This image is a compilation of three images from Envisat’s radar, acquired on Sep. 27, Oct. 27 and Nov. 26, 2011.